Scottish criminal justice agencies have rejected pleas to investigate the failure of two ministers to improve the safety of the government’s “fitness for work” test, despite evidence that their actions caused the deaths of at least three benefit claimants. Police Scotland was asked in March to investigate allegations of “wilful neglect of duty” by former Department for Work and Pensions (DWP) ministers Iain Duncan Smith and Chris Grayling. A dossier containing details of the deaths of three benefit claimants with experience of mental distress was passed to Police Scotland by the Scottish grassroots campaign network Black Triangle. The three claimants – Paul Donnachie, David Barr, and a woman known only as Ms D E – took their own lives in 2015, 2013 and 2011 as a result of grave flaws in the work capability assessment (WCA). 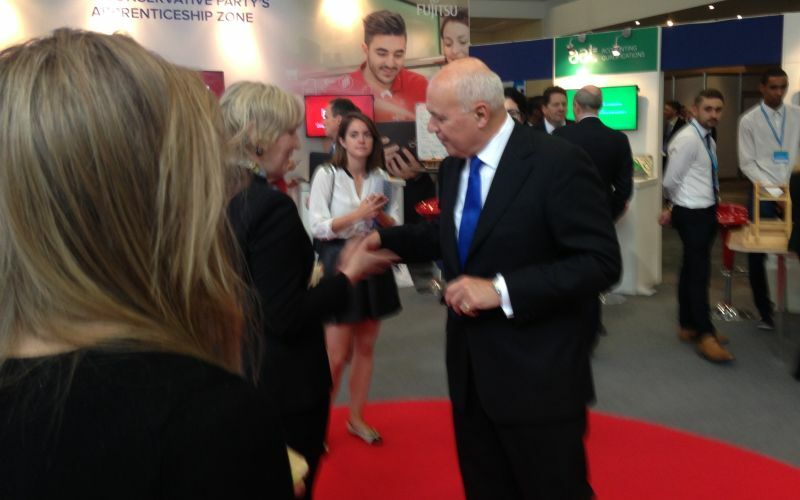 These flaws mirrored those uncovered by a coroner in January 2010, following the suicide of Stephen Carré, and passed to DWP in a prevention of future deaths report just a few weeks before Duncan Smith (pictured at this year’s Tory conference) and Grayling took up their new posts following the May 2010 general election. Black Triangle approached Police Scotland with the dossier in March 2016 because it believed there was clear evidence that the two ministers neglected their duty as public servants in refusing to bring in the changes called for by the coroner, so causing other deaths, including those of Paul Donnachie, David Barr and Ms D E.
Black Triangle said its dossier concluded that, “were it not for the alleged criminal omissions by the two ministers, these and countless other deaths could have been and could yet be avoided”. But nine months after Black Triangle passed the dossier to Police Scotland, the force appears to have done little to investigate the allegations, other than consulting with the Crown Office and Procurator Fiscal (COPF), the Scottish equivalent of the Crown Prosecution Service. This week, Edinburgh police confirmed that it would be taking no further action on the David Barr case, while COPF said that it had also decided that no further action should be taken on the Paul Donnachie case. Police Scotland said that COPF had already decided that there was no link between DWP’s decision to find David Barr fit for work – following a 35-minute assessment by a physiotherapist – and his decision to take his own life a month after being told by DWP he was not eligible for employment and support allowance (ESA). Maureen Barr, David’s mother, said this week that she was “disappointed” at the COPF decision, but “definitely” still wanted Duncan Smith and Grayling to face justice. John McArdle, co-founder of Black Triangle, said: “We have been given no detailed information on what legal reasoning has been applied to any of the above matters and there seems to be complete silence on the compelling evidence set out in the case of Ms D E.
“In all the circumstances, this conduct is totally unacceptable and constitutes an insult not only to the families of the deceased but to every disabled and vulnerable Scot and their families who look to Police Scotland and the COPFS to keep them safe. “This is not over. We are consulting with our legal advisers and will be taking this all the way. “For disabled people in Scotland and equally throughout the UK these are literally matters of life and death and Black Triangle campaign will not let them down, whether or not the state chooses to. A COPF spokesman said: “The circumstances surrounding the deaths of Mr Donnachie and Mr Barr have been fully investigated. “The Procurator Fiscal and Crown Counsel have respectively concluded that no further investigation is required and that no further action should be taken. Police Scotland has previously said it would only look at the Ms D E case if Black Triangle or Disability News Service were able to pass on her personal details. But those details have never been made public, as her death was the subject of a report by the Mental Welfare Commission for Scotland (MWCS), which treated her case anonymously and concluded that she killed herself after being told she was not eligible for ESA. The report linked her death to DWP’s failure to obtain medical evidence about her mental health from the professionals who had treated her, just as the coroner had done in the case of Stephen Carré. This week, MWCS declined to comment when asked if Police Scotland had requested Ms D E’s details, stating that it was “for Police Scotland to respond to your request related to any investigation”. Police Scotland and COPF had both refused by 11am today (Thursday) to say whether they had attempted to contact MWCS since receiving the Black Triangle dossier in March. McArdle said the Police Scotland and COPFS responses “beggar belief” and that an email to him from MWCS earlier this year “clearly shows that the ball was in Police Scotland’s court to contact the chief executive of MWCS”.